Ever since their initial mint in 1967, South African gold coins have been known among gold investors for their immaculate purity, value and historical value. Krugerrand is an official name that is associated with South African coins made of gold that are embellished by an image of the South African President who served four terms; the reverse side bears an image of the official animal of the South African Republic, a springbok. 1. Krugerrand gold coins are desirable additions to your numismatic collections as well as precious metal investment portfolio due to their superb durability compared to other gold coins made possible by 91.67 % gold to 8.33 % copper alloy composition. This allows your South African gold coins to resist surface damage and retain their original state for longer periods of time. 2. 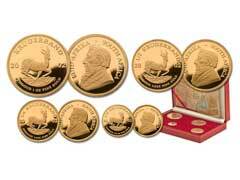 Krugerrand gold bullion coin contains one troy ounce of superb South African gold. Since the production of gold becomes more and more expensive every year and the supply dwindles, the prices for precious metals are sure to stay high providing an excellent protection from decreasing potential of many national currencies. 3. While buying these coins, you can be confident in their absolute liquidity that could be satisfied at any time once a need arises. They are one of the most popular pieces that are traded daily in large quantities all over the world. 4. If you decided to add gold into your investment portfolio, most investment advisers prefer South African gold coins over gold bars due to ease of storage, portability and lower costs associated with transportation and handling. 5. Investing in South African Krugerrands is beneficial due to considerably lower premiums compared to buying any other gold coins with similar characteristics. Lower premiums mean you can considerably cut your investment costs with these coins. 6. Higher collector and investor interest ensure optimum purchase price for Krugerrands due to coins’ “illegal” status that was lifted fairly recently, in 1994, for political reasons. 7. Krugerrands are perhaps an ideal way to invest in gold that could easily fit into your life. These are highly movable and could be easily carried in case of emergencies that will provide a perfect shield in harsh economic times. However, not many numismatic specialists find gold Krugerrands appearance to be of any aesthetic value, on the contrary, if you are seeking coins that are beautiful, you should definitely check out British gold coins that have always been known for their fine designs.